Supplementary material reads: "Daily. Gershon. City Desk. Illus. Rare Boxer Litter. When bigger and better dog records are made, Dolphin and Paseo Del Mar Streets in San Pedro can make them!. 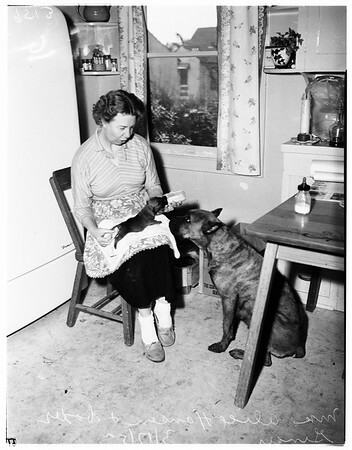 Mrs. Alice Hansen, 3721 Dolphin Street, is shown giving one of twelve Boxer puppies to her pedigreed Boxer 'Ginger', supplemental feeding of milk from bottle while 'Ginger' looks on. Dog authorities say twelve Boxers are rare as litters go, the average being six to eight. The record Boxers recalled to neighbors that only last Christmas, Mrs. Dorothy Zane's Springer Spaniel 'Freckles' presented a litter of ten puppies -- all boys which is also very rare. 'Ginger's' real name on the American Kennel Club records is 'Loualad of Dolphin' and she is a Golden Brindle, white. Father of the puppies is war Prince of Wilmington. Ginger's immediate forebears are: Sire, Tabor of T-Cap and the Dam: Linda Turnabout. All twelve puppies are doing well".